David Gibson and Jonathan Gibson, ed. 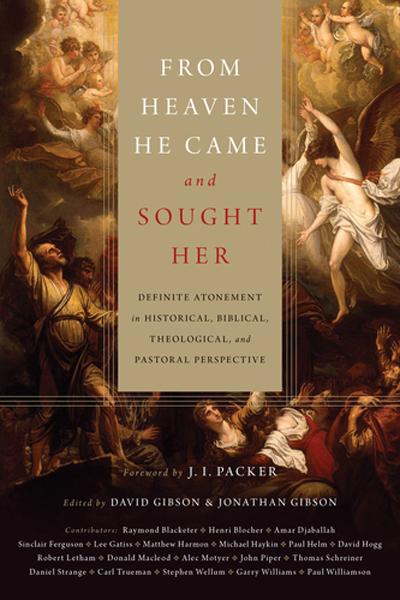 From Heaven He Came and Sought Her: Definite Atonement in Historical, Biblical, Theological, and Pastoral Perspective. Wheaton: Crossway, 2013. 704 pp. $50.00. I came of age during the early days of what is now known as the Young, Restless, and Reformed movement. The doctrines of grace were worn like folded-and-rolled-up blue jean cuffs in junior high—everyone followed the fad even if you didn’t know why. Though I have benefited immensely from the Reformed tradition and its leaders, this very tradition’s high regard for Scripture has kept me from embracing the doctrine of definite atonement. I have read John Owen and J. I. Packer, and yet I cannot find definite atonement substantially or successfully defended in the Bible. I would classify my view of the intent and extent of the atonement with those who hold to hypothetical universalism, though I don’t like the name. I believe simply that the death of Jesus Christ achieved a sufficient atonement for the sin of every human being, while that atonement is only efficient for those who believe—the elect of God. I am grateful I was required to read Owen and many other definitive atonement advocates in my doctoral studies. I agree with Packer that Owen’s The Death of Death in the Death of Christ has a Stonehenge-like “clumsy dignity” and requires a significant diligence on the part of the reader. Nevertheless, Owen’s work has long since been the standard to which all those in search of the mysteries of definite atonement are pointed. From Heaven He Came and Sought Her, too, has some Stonehenge-like qualities that require a reader’s fortitude (including the size and shape of the volume). But I agree with Packer that with this volume, studies on the definite atonement have “come full circle” (14). After six years of labor, editors David Gibson (minister of Trinity Church in Aberdeen, Scotland) and Jonathan Gibson (PhD candidate in Hebrew studies at Cambridge University) [read an interview with the editors here] have provided a tsunami of a book that cannot be ignored by any student of the Bible. Though I’m reluctant to award it the title of “definitive” at this point in its short shelf life, the volume is now at least an intersection through which all related discussions must travel. While not yet definitive, this volume is a book of definitions. By “definite atonement” the authors mean that “the atonement is specific in its intention (Christ died to save his people) and effective in its nature (it really does atone)” (51). The contributors have a negative posture toward the “bad habit” of the use of the term “limited atonement,” as this “seems to have been canonized about a century ago, when the mnemonic TULIP came to be used as a summary of what is supposed to make Reformed Christianity into what it essentially is” (15, 148n30). Much of this volume is an intramural discussion among family members. While the claims of the contrasting views of semi-Pelagianism and Arminianism are addressed, the vast majority of the 23 chapters compose a treatise seeking to differentiate definite atonement from hypothetical universalism and Amyraldianism. The distinctions between these views are significant. In one instance, the editors refer to those who deny definite atonement—but are not universalists, semi-Pelagians, or Arminians—as “awkward cousins” (43n30). I actually like this term. Regardless of whether it conveys an image of Christmas Vacation’s plastic-plated Cousin Eddie arriving at Clark Griswold’s home for the holidays with his battered RV and promising not to leave for a month, it implies we are all still family. Yet the awkwardness is real as across each chapter and even under the editorial proviso of charitableness there are mixed messages in terms of whether this awkward cousin is truly welcome at the family table of conversation, as at times hypothetical universalism is hardly distinguished from Arminianism (436, 639). Ultimately, the distinctions lie in both the intent and extent of the atonement. For definite atonement advocates on the one hand, the intent and extent apply only to the elect, hence “the death of Christ was intended to win the salvation of God’s people alone” (33). The hypothetical universalist, on the other hand, believes the death of Christ was intended for all of humanity but in extent is effective only for the elect. Overall, I take the abundance of interaction over hypothetical universalism as a good and hopeful sign that speaks to the validity of this view. For readers who likely will not have the opportunity to read all 704 pages, I recommend they not miss the following Samaritan-like chapters. (1) Lee Gatiss’s presentation on the Synod of Dort is heads above the best of the historical chapters and quite charitable toward hypothetical universalists. (2) I would not overlook Tom Schreiner’s work on “Problematic Texts” for definite atonement in the Pastorals and General Epistles, as he is characteristically fair and thorough in dealing with 1 Timothy 2:1-7, 4:10; Titus 2:11-14; especially 2 Peter 2:1; 3:9; and Hebrews 2:9. (3) Henri A. G. Blocher’s systematic rendering of the doctrine might be the best overall chapter in the volume. He recognizes that the discussion is one of “dissent among divines otherwise in communion” (538) and though he finds hypothetical universalism wanting, he attempts, at the end, an exercise in subtlety and nuance to “bring into closer fellowship minds desirous to honor the Lord and Savior of the world” (578). He is refreshingly honest in expressing reticence toward the practice of telling unbelievers “Christ died for you,” and though I’m not persuaded to adopt his preferred “Christ invites you,” I do appreciate his candor and ultimate willingness to share the gospel message with the lost (565). (4) Further, I would commend part of Robert Letham’s chapter on the incarnation. While he offers substantive critique of T. F. Torrance’s view of the relationship of incarnation and the atonement, his parsing appropriately identifies confusing portions of the Torrance thesis. Letham does concede that there is “coherence of incarnation and atonement” (451). Here I think we find the beginnings of substantial discussion. To further explore the relationship of the extent of the atonement with the extent of the incarnation is, I believe, the starting point for one of the stronger arguments in favor of an atonement sufficient for all with whom Christ shares the same flesh and blood (Heb. 2:14). The chapters I found least helpful are all tied to a common assumption about the equivalence of the amount of sins for which Jesus paid. (1) The portion of Robert Letham’s chapter on the Trinity draws the following conclusions: hypothetical universalism cannot “yield a doctrine of penal substitution” and thus disrupts the Trinity for “the electing purpose of the Father and the work of the Spirit are in conflict with the intention in the death of the Son on the cross” (436). (2) Garry Williams’s chapters question the validity of hypothetical universalism based on an incompatibility with penal substitution and the perception of a double payment for sins. Williams’s arguments operate under the view of equivalency that Jesus died for “specific sins and sins of a particular people” (476). If that is the case, then, yes, there are difficulties with the Trinitarian nature of the atonement, the connection of penal substitution, and a sense of double payment for sins. But Letham and Williams seem to confuse intent and extent. If, as they say, the death of Christ is seen in quantitative terms in that Jesus was punished for a finite set of sins—the specific sins of every human being—then the Son made just payment for people the Father didn’t elect and the Spirit didn’t call. Further, if Jesus’ death was a perfect substitute for all these specific sins and people, then Letham and Williams are right to conclude that either we should affirm universal salvation or there is a double payment for sin—once at the cross, and again by those outside of Christ who fall under God’s judgment. Yet this kind of one-for-one correspondence of death and propitiation for a certain number of sins, while logical, is difficult to support with Scripture. Also, the belief in the equivalency of specific sins is not the historic majority view, even among the Reformed (and several contributors and endorsees of the volume). As Charles Hodge wrote, “All that Christ did and suffered would have been necessary had only one human soul been the object of redemption; and nothing different and nothing more would have been required had every child of Adam been saved through his blood” (Systematic Theology, II: 545). In my understanding, the death of Christ is the death of an infinite being bearing the wrath of God for infinite sin. (3) While I admire God’s grace in the ministry of John Piper to restore a God-centered delight in God’s glory, Piper’s concluding chapter stretches too far when he posits that “[w]e diminish the glory of the cross and the glory of grace and the glory of God when we diminish definite atonement” (663). He states that his “point is not to nullify or undermine anyone’s faith or ministry” (630), but he places the Arminian and Amyraldian/hypothetical universalist views together and argues that they don’t allow “our people to feel loved with the fullness of God’s love for them” because such is “muted where it is seen as an instance of the same love that Christ has for those who finally perish” (637). Here, and in other places in the volume, the Reformed view of election bleeds over to a discussion about the atonement. While I agree that the two are connected, in a volume of this detail and microscopic focus such confusing emphases should be minimized or acknowledged. The “From heaven he came and sought her” line from the hymn “The Church’s One Foundation” is glorious and entirely appropriate for this volume’s expression of the extent of the atonement. In light of the distinctions and differences this volume engenders over the intent of the atonement, another hymn, “And Can It Be?” comes to mind with the line, “Emptied himself of all but love, and bled for Adam’s helpless race.” Like Spurgeon said in another but related context, in my view we don’t have to reconcile conflicting hymns; they are friends. More than that, they are family—awkward cousins and all. Editors’ note: For a different perspective on the book, see Robert Yarbrough’s review. You can also read an interview with the editors. ​Jason G. Duesing is provost and associate professor of historical theology at Midwestern Baptist Theological Seminary in Kansas City, Missouri. He is the co-editor and author of First Freedom: The Beginning and End of Religious Liberty (B&H Academic, 2016). You can follow him on Twitter or at JGDuesing.com.